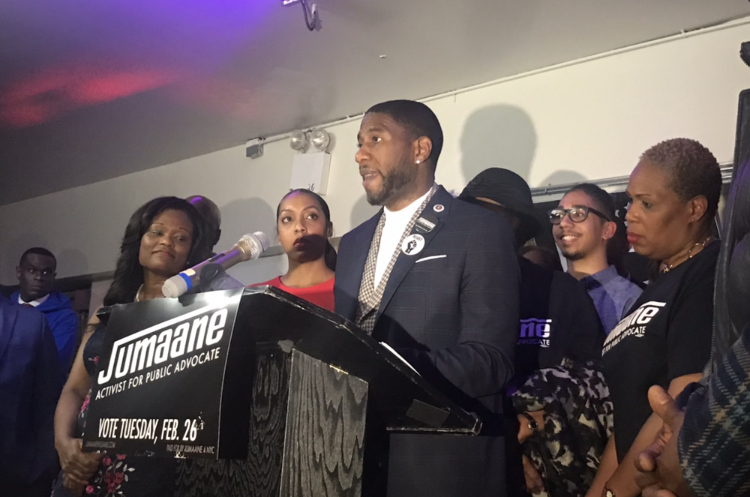 EAST FLATBUSH — City Councilman Jumane Williams dominated in Tuesday’s special election to claim the interim post as New York City’s fifth public advocate. Williams, one of 17 candidates on the ballot, won 33 percent of the vote with 98.01 percent of precincts reporting. More than 133,000 people bubbled in for the Brooklyn lawmaker who beat the runner-up, Eric Ulrich—a Republican—with more than 56,000 votes. Melissa Mark-Viverito came in third place with 44,128 votes and Michael Blake in fourth with 33,198 votes. The Board of Elections (BOE) lists the voter breakdown here. Williams replaces Letitia James who vacated the seat to become New York state attorney general. Williams will run again during a primary and then a general election in November to secure a full-term which expires in 2021. The native Brooklynite took the stage after 10:30 pm at Cafe Omar in East Flatbush. “There was power when I ran for lieutenant governor and there was power when I ran for public advocate,” said Williams in what turned into an emotional testimony about his 3-year stint in therapy and a pep talk for youngsters who may look up to the East Flatbush native. Just could not be prouder. The most fearless voice for justice I know in elected office. The one who calls us to be our most courageous selves. Our new NYC Public Advocate. The rest of the evening was filled with lots of celebration. More than a dozen politicians dropped by, including Councilmembers Mark Treyger, Vanessa Gibson, Jimmy Van Bramer, Robert Cornegy and Brad Lander. Assemblymembers Walter Mosely and Rodneyse Bichotte also attended, the latter of which served as the evening’s emcee. Manhattan Borough President Gale Brewer stole the show when she recounted a story from earlier in the day about a run-in she and Williams had with someone that claimed they sat on Williams’ trial. “It doesn’t get better than that,” she added. Majority Speaker Laurie Cumbo was also there to congratulate her fellow Brooklyn Technical High School alum on his victory. Ulrich, a Queens councilman, captured between 29 and 50 percent of his borough’s vote but dominated in the Rockaways, most of Staten Island and all of Brooklyn’s Borough Park. He also captured some of the Southern Brooklyn voter base including the 41st, 46th, 47th and 49th assembly districts, all of which are represented by Democrats but are the city’s largest Republican base. The small sliver of Bay Ridge that falls into Assemblywoman Nicole Malliotakis’ district, a Republican looking to oust Congressman Max Rose, voted overwhelmingly for Ulrich. Melissa Mark Viveritto, who only captured 10.96 percent of the vote, took Mott Haven, Hunts Point and East Harlem, where she once served as a councilwoman. 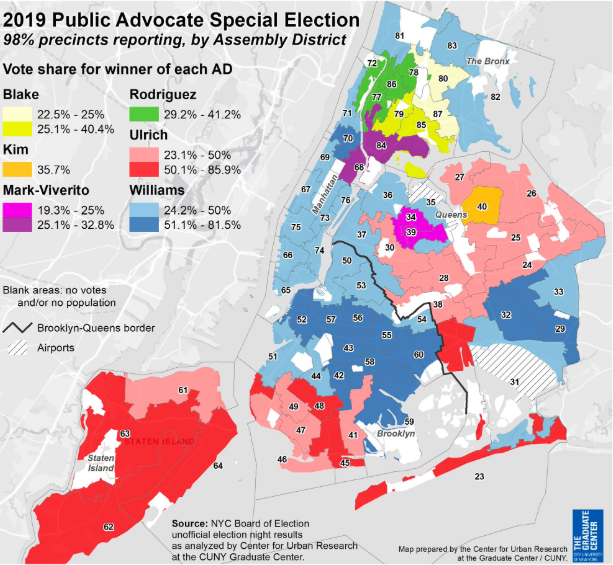 But the former city council speaker wasn’t able to make a dent outside of her former district outside of a portion of Jackson Heights and Corona. The Bronx was split between Councilman Ydanis Rodriguez and Assemblyman Michael Blake both of whom serve as lawmakers in those districts. 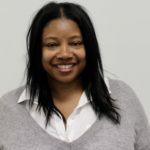 At least a half-dozen candidates have opened committees with the New York City Campaign Finance Board to replace Williams in the 45th Council district, which encompasses East Flatbush, Flatbush, Flatlands, Marine Park, and Midwood. Bklyner covered the slate of candidates last month, some of which have already started fundraising. I wonder who Williams’ ex-girlfriend voted for. you know, the one he was arrested for harassing a few years back? So much for #metoo, I guess. a MeToo movement that requires due process as well as exposure. if it is to remain both valuable and valid. and who in the police department or elsewhere was responsible for their release.